For those “uninitiated” in the ways of gypsy jazz guitar picks, a little background here would be helpful. 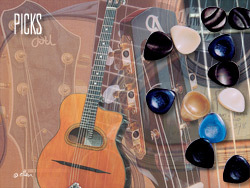 The picks used by gypsy jazz players – versus the typical electric or acoustic guitarist – are very different. Gypsy jazz players are often playing fast solo lines, on guitars with relatively high action. Slurring is just about impossible, so every note must be picked. The only way to accomplish this is with very rapid and coordinated wrist action, and with a strong pick that is essentially an extension of the player’s wrist. Also, to execute the distinctive gypsy jazz Rhythm guitar style known as “la pompe” (literally “the pump”), one needs a thick, hard pick that can “thwack” away forever. The picks themselves are large, with surprisingly blunt looking tips, but have gripping slots, or contours, for the fingers and the thumb. They can cost $20 or more, especially if made of tortoise shell or equally exotic material. Even for very good guitarists who are new to gypsy jazz guitars and technique, it is a revelation to them how advantageous it is to use the appropriate gypsy pick, over their more familiar Fender medium or such. Only these thick, strong picks can properly ‘drive’ the gypsy jazz guitar to get the authentic sound to emerge. I will use just about anything thick enough and with some contour, and any material. But my first choice is J.C. Dugain’s “Horn” picks. They’re softer than bone (which squeak, by the way! ), but harder than any wood, so they’re durable enough. I happen to hold the Dugain pick backward: I don’t place my thumb in the thumb slot. This makes the pick feel even thicker in my long skinny fingers, and still allows for a firm grip. When I can find them, I buy a pocket full of Jim Dunlop “Big Stubby’s” (the biggest ones). On gigs or at jam sessions, I’d prefer to lose a 50 cent plastic pick than an expensive and exotic one. And they do the job just fine. Some nicely contoured wood picks are available inexpensively from John Pearse. From this bunch, the ebony picks are the best for me. Michel Wegen from The Netherlands makes popular gypsy picks, often from synthetic materials, and in a variety of shapes and sizes.